Such a quick expansion would have been unimaginable without support from part of the Visigothic aristocracy, a sector of the Church, the oligarchy of Roman Hispanic landowners, and, apparently, also from the large Jewish minority. The same process that made the conquests of Syria and Egypt possible was repeated, although with some differences. In general, the history of the Iberian Peninsula, today incorporating Portugal and Spain, has since Prehistory experienced phases of Europeanisation and Orientalisation – depending on whether the main cultural influx came from north of the Pyrenees, the Italian Peninsula or the Eastern Mediterranean, directly or through Northern Africa. The Muslim Arab conquest was, beyond doubt, the last of the big Orientalisation phases that affected this extreme tip of Europe. Spanish historiography, deeply influenced by ideological concepts that in some cases go back only to a few years after 711, has obstinately insisted on emphasising, or maybe even inventing, the role that native tradition at the time of the conquest – i.e. late Roman – played on the origins, development and evolution of the historic phenomenon known as al-Andalus. Although the arguments have been very persistent, they have never been entirely convincing, except for those who want to believe them. The similarities between the material culture – leaving religion aside – of the invaders and the conquered should not be explained or interpreted as mere influence of the latter over the former. Instead, other arguments not completely excluding this influence in certain matters, should be taken into account. At the peak of its power, the Umayyad dynasty, the main political protagonist of the conquest, was creating at its epicentre an artistic world with Syrian roots mixed with Roman-Byzantine and Iranian elements, to the extent that even Syria, where the dynasty settled, started copying this method in its artistic tradition. For years, the most western province of the Islamic Empire did not vary substantially with regard to the method implemented after the conquest. However, three different processes started to occur slowly: Arabisation, or change of vehicle of expression from Latin to Arabic; Islamisation, namely the conversion to Islam of the majority of the population; and Berberisation, the occupation of sparsely populated areas by people from the Maghreb, in line with Arabisation and Islamisation. It could be the arrival of the last Umayyad Prince Abd al-Rahman [I] al-Dakhil (“The Emigrant”) (r. 756 –788), who had escaped from the coup d’état of the Abbasids and was the sole survivor of the massacre of his family, that caused a radical change. Al-Andalus separated from the Islamic Middle-Eastern Empire, which in turn accentuated its Iranian character and moved its centre of gravity to Baghdad, which had been until not long before, the epicentre of the Persian Empire of the Sassanids. Paradoxically, the western Umayyads did not initiate a Westernisation process that would emphasize their Roman cultural features. On the contrary, they kept an Umayyad appearance, especially with the claim for the right to the Empire that had been taken away from them, and they started copying their enemies’ state structure in every sense. The same occurred with culture and art. Al-Andalus became more Iranian, in the sense that they adopted rules that had some resemblance to those of the Persians. This explains the building, in the middle of the eighth century, of the Almunia of al-Rusafa (756), near Cordoba; and of the first phase of the construction of the Great Mosque of the Andalusian capital (786–787), thanks to the first monarch of the dynasty; and the construction of the palatine city of Madina al-Zahra (begun in 937) as well as the third phase of the Great Mosque in Cordoba (961), thanks to the second and third caliphs of al-Andalus, Abd al-Rahman [III] al-Nasir (912–961) and al-Hakam [II] al-Mustansir (961–976). Even fashion and most of the traditions from the western Islamic court were subjected to an Orientalisation process, that was represented by the famous musician Abu ‘l-Hasan Ali Ibn Nafi, known as Ziryab (789 – around 857), who arrived in Baghdad and played an outstanding role in the movement that introduced Abbasid cultural novelties. The indigenous population did not participate in this long and complicated process, which was to some extent responsible for the implosion of the Andalusian Umayyad Dynasty, which disappeared leaving a deep cultural and institutional legacy in the Mediterranean, in al-Andalus and in the Maghreb. Immediately after the establishment of the Umayyad dynasty of Cordoba in al-Andalus, all their achievements had a very eastern style. However, since the reign of Abd al-Rahman II (822–852), this tendency is observed not only in religious architecture – the Great Mosque of Cordoba (848) – but also on military constructions – the Alcazaba of Merida (Badajoz, Extremadura) (855). It was the proclamation of the caliphate (929) that would give a clear Orientalisation process, based on the formal characteristics of the Syrian Umayyad tradition and the incorporation of other traditions that came from Iraq, as can be witnessed in what has been preserved from the palatine city of Madina al-Zahra and from the third phase of the Great Mosque of Cordoba (961), sponsored by caliph al-Hakam II. Iranian heritage becomes even more evident in the iconography of ivories, probably created by non-native specialists, during the reign of Abd al-Rahman III, not long after he proclaimed himself Prince of the Believers (929). Made for the court and, above all, as diplomatic presents, the ivories constitute a paradigm of western Umayyad decorative style and a defining feature of what was becoming an authentic dynastic art. The iconography of ivories – e.g., the casket from Leyre in the Museum of Navarra – and its vegetal patterns, as well as the rare silver examples that arrived in Spain – e.g., the casket in the Cathedral of Gerona – give a precise idea of the image that the Cordoban caliphs wanted to portray: following an already Oriental tradition and adjusting it to the Abbasid artistic trends. Mesopotamian influence is also reflected in other art expressions like pottery, but it was not as developed in technique or in iconography at that time. The collapse of the caliphate of Cordoba did not end the courtly art, which was partially taken over by the courts of the small principalities known as the Taifa Kingdoms (muluk al-tawaif) – from eleventh to beginning of the twelfth century –, although in a less monumental scale in its “imperial” appearance and entrepreneurial ambition, and by the Almoravid sultanate – end of the eleventh to the mid-twelfth century –, which introduced it in its new Maghrebian settlements and gave it a wider geographical range. Nevertheless, there was an almost radical change in the conceptual point of view: Andalusan art continued developing until well after the Castilian conquest of the Granada sultanate (1232 –1492), prevailing in the so-called “Mudejar style”. Although there were some new influences from the Islamic East, one can say that the development of Andalusan art after the eleventh century was, essentially, based on its own tradition. From then on, it only used selected forms of vegetal and geometric patterns and opted for a more stylised form of the palms, elongated and intertwined. It was only during the Almohad period – from the mid-twelfth to the mid-thirteenth century –, that palms without much detail, or even plain ones, were preferred for official monuments. The plastic arts were a way of disseminating the political and doctrinal differences of the new western Sunni caliphate that considered itself, despite its Berber origins, successor and follower of the Umayyad caliphate of Cordoba. It cannot be denied that the Nasrid sultanate of Granada reached a highly refined level in its artistic endeavours and that it developed an autonomous evolution of the Andalusian style, nearly untouched by Middle Eastern currents, despite intense commercial exchanges with Egypt. The Andalusian artistic heritage continued in al-Maghrib al-Aqsa, nowadays Morroco, and it even reached sub-Saharan areas – Mauritania and Mali to the South; and the eastern border of Tunisia to the east, thanks to artisans that prolonged it for several more centuries with remarkable technical ability nourished by stylistic means which came all the way from Umayyad Cordoba. The Mudejar phenomenon started in some parts of the peninsula as they were absorbed militarily by the northern Christian kingdoms. It was not univocal, as it extended and diversified with time, dividing itself into different schools depending on the conquering states – Portugal, Leon, Castilla and Aragon – and chronologically. Considerable colonies of Muslim craftsmen, called mudejares, stayed, especially in some cities, and continued working with the artistic tradition inherited from their Andalusian ancestors. In most cases these artisans would stay isolated from their colleagues from Islamic territories and would repeat, or rather fossilise, the style of the place where they were living. On some occasions, royal patronage, aristocratic or ecclesiastic, would refresh the tradition and favour works from foreign artisans coming from what was left of al-Andalus. Although their roots were identical, these artisans had a more developed style. In other cases, people coming from newly conquered territories settled in places where Islamic tradition had disappeared or had never existed, and new manifestations, classified as mudejares, appeared, which had no connection to previous local traditions. It should also be taken into account that Crusades and cultural exchange brought new Islamic trends that mixed with the local ones, especially in Aragon. Whether the authors were local artisans, experts on what was being done in the Middle Eastern Islamic states, or foreigners established in the peninsula thanks to the tolerance from which they benefited, the fact is that certain features, such as polygon-base towers in many Aragon churches, can only be explained as an imitation of the Ayyubid, Mamluk, or even Ottoman minarets from the same period. Everything about this astrolabe indicates that it came from Spain: the rete (ankabut, or “spider”), representing part of the celestial coordinate system; the fixed stars form a network ornamented with openwork, the line of which is characteristic of Maghribi and Andalusian instruments. Indeed, on the ecliptic circle, which bears the names of the zodiacal constellations in Latin and Arabic, the cut-outs are in the form of half quatrefoils; they end in three openwork rings and a long curved point. The point indicates the exact position of the star whose name is engraved on the base in Arabic and Latin; other star names are inscribed on the outer circle and the segment of the median circle (equator). There are four tympani, each bearing a projection of the celestial coordinates onto the given terrestrial coordinates. Three of them, which date back to the first phase of the instrument’s history, are for latitudes ranging from Jerusalem to the north of Paris. While many astrolabes made in al-Andalus (Arab-controlled Spain) during the eleventh through fifteenth centuries have been preserved, only five astrolabes from pre-fifteenth-century Christian Spain are extant. Four of them are from Catalonia. This one does not come from there, and furthermore is the only one with inscriptions in Arabic, Latin and Hebrew, the latter in the form of scratches, more than engravings, on one of the tympani. The ring topping the openwork “throne”(kursi) bears an Arabic inscription: “Its owner [is] the poor Masud confident in Him who should be adored”. Moreover, the last tympan, which probably dates to the second phase of execution of the astrolabe, is marked Ard al-Jaza’ir (latitude of Algiers or the Balearic Islands); on the back is a tympanum corresponding to the latitude of Mecca, which is not mentioned by name. It is possible that the inscriptions on the ring and the last tympanum were done by the same hand, namely that of Masud. On the back, the centre of the mater bears a double shaded square and, on the circumference, the signs of the zodiac in Arabic (to the outside) and the names of the solar months (to the inside), in inlaid and engraved silver cartouches. The inlaid silver cartouches are unique on a western astrolabe. In any case, there are a number of mistakes in the Arabic, which is probably evidence of a vernacular Arabic – and therefore, of the survival of Arabic in Spain long after the Reconquista. This composite capital, with two lines of acanthus leaves, represents a brilliant phase of Andalusian architectural sculpture. The model of Corinthian capital, which can be found in numerous Roman ruins in Spain, as well as in later Visigothic interpretations, reaches here a very refined elegance. The general structure of Corinthian capitals is respected, rendered livelier by two rows of deeply carved foliage sprouting in a bee’s nest arrangement and a base of plain stalks where the second row of leaves starts. Over the bead-and-reel band, an equinus, also with a bee’s nest arrangement, is topped by four projecting volutes, demarcated by curling acanthus leaves; on top, there are four dados, also with vegetal motifs. The Aga Khan Museum capital is similar to the ones made for the reception room of ³Abd al-Rahman III in the royal palace at Madinat al-Zahra, six kilometres from Cordoba, which date from between 342 and 345 H (952 -3 and 956 -7), according to inscriptions found on the bases. The same composite type, with two rows of acanthus, have been found there. The bead-and-reel pattern is also used, as well as the overall sculpture of the set, with rectilinear carving, and identical decoration of the volutes. From the forty capitals which originally crowned the marble columns of the room, before its destruction in the eleventh century, only eleven remain in their original position. Had they been worked from cubic or nearly cubic blocks, the final result would have been very different from what we can see here. From their shape, the capitals from that room are not cubes. Our object relates more to a capital from Segovia dated 349 H / 960 -1 CE; both capitals are drawn from a perfect 28cm cube. Aesthetically they are very close, although the one shown here shows cleaner craftsmanship, undoubtedly due to its good state of conservation. Composite capitals reappear during the reign of ³Abd al-Rahman III. One from Loja dated 340 H / 951-2 CE, represents a good and early example. Another, from the collection of Al-Sabah (362 H / 972-3 CE, is a bit more decorated than the one here (Dar al-Athar al-Islamiyya, LNS 2 S). Thus it is reasonable to date ours between 340 and 362 H (951- 2 and 972-3 CE). During the fitna (revolution) of 1010 and the plundering of Madinat al-Zahra the same year, and later during the collapse of the caliphate of al-Andalus in 1031, objects were disseminated. Even architectural elements were affected; for this reason, many Andalusian capitals were reused elsewhere, even in Italy. This manuscript contains the earliest extant copy of al-Zuhri’s Book of Geography, followed by what is probably the earliest version of the famous stories of the Abbasid caliph Harun al-Rashid, A Thousand and One Nights, thought to have been adapted from a Persian source. The Book of Geography was written as a companion for a map of the world commissioned by the Abbasid caliph al-Mamun. It provides a description of the world at the time, including important new information about trade routes and commodities traded in the western Islamic lands and sub-Saharan Africa, as well as about the expansion of Islam. The second oldest copy is housed in the Bibliotheque Nationale, Paris, and is dated 1410 CE. The version of A Thousand and One Nights in this text is written in maghribi script and entitled A Hundred and One Nights, establishing its antiquity within the larger “Nights” tradition. This scribe’s wooden cabinet is a rare survival and an extraordinary example of luxury woodwork production in Spain under the Nasrids (1232 –1492). The tradition of inlaying walnut dates back to the Umayyad period in Spain (756 –1031), and may be seen in extant mosque minbars (pulpits), doors and a variety of objects. The hallmarks of Nasrid era woodwork include LAelaborate inlays of ivory, bone, metal, wood and mother-of-pearl. The decorative programme of this cabinet includes large eight-pointed stars formed from interlocking squares; these motifs appear on many of the extant Nasrid wooden pieces in Granada museums and at the Alhambra. The cabinet contains a lidded interior compartment which probably contained writing implements. This rare lamp stand, of which there is a similar example in the David Collection, Copenhagen, was produced under the Spanish Umayyads (756 –1031), descendants of the first Muslim Umayyad dynasty based in Damascus. When the Abbasids overthrew the Umayyads in 749, the only surviving member of the family fled to the Iberian Peninsula and founded a new branch of the dynasty. Although the object includes a typical Islamic inscription in Arabic Kufic script, its form and decoration reflect the Byzantine culture that preceded Umayyad rule in Syria. Carved wooden corbels, Spain, Toledo, 13th –14th century, Carved oak. Wooden beam, Spain, Toledo, 13th –14th century, Carved oak. The Mudejar style of the Iberian Peninsula grew out of a synthesis of Muslim, Christian, and Jewish artistic idioms beginning in the twelfth century and continuing through the end of the fifteenth century, when the Mudejars, i.e. Muslims who had remained in the region after the Reconquista but who continued to practice their own religion were forced to convert to Christianity. During the mediaeval period, Mudejar artisans excelled in the crafts of woodwork, plaster work, pottery, metalwork, and textile production (Ecker 2004, p. 58). The beautifully carved wooden corbels and beams in this group contain design combinations reminiscent of other architectural elements attributed to Toledo. Split and curved palmettes, for example, appear in corbels in the collection of the Hispanic Society of America, New York (Ecker 2004, pp. 64 – 65 and 147– 48 [no. 56, inv. no. D51– D60]). Heather Ecker notes that the combination of the curved palmette motif (which “sweeps back from the top volutes like the prow of a ship, in Spanish, canecillos de proa or quilla, between two vine tendrils that project outwards as points”) and the appearance of multi-petalled rosettes distinguish these examples as typical of Toledo rather than Granada as a place of production (ibid., p. 147). Further comparative examples can be found in the David Collection, Copenhagen (von Folsach 2001, p. 271 [fig. 437, inv. no. 46 a-b /1999]). Traces of polychrome decoration on some of the works in this group (i.e., cat. 48) suggest that these architectural elements were once painted in colour. Three triangular ceiling panels with interlacing geometric designs, Spain, al-Andalus, Nasrid, 14th –15th century, Wood, carved and painted, each panel 151 cm. The long tenure of Nasrid dynasty (1230 –1492) in the Andalusian state of Granada was remarkable considering the frequency of political and military challenges that existed in the region while they were in power. As the centre of authority in the Islamic lands shifted from the central more towards the eastern Islamic lands in the Middle Ages, the western regions began to develop their own more uniquely regional styles; Spain and North Africa were no exception. In Spain, the coexistence of Muslims, Christians, and Jews led to a synthesized style which would distinguish the art and architecture of this region from that of the rest of the Islamic world. The three architectural panels shown here probably originally belonged to a ceiling made of wood, a popular medium for the representation of interlacing geometric designs appearing in the fourteenth and fifteenth centuries. Each equilateral triangular panel is subdivided into smaller panels that form a radiating design starting from an nine-pointed star shape at the centre. 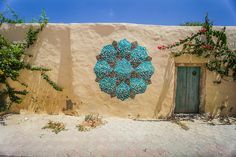 This is a modification from a pattern based on the eight-pointed star, produced from the superimposition of two interlocking squares at a 45 degree angle that appears as wall decoration at the Alhambra fortress of the Nasrids in Granada. Heather Ecker has described this design principle, known as the “lazo of eight”, which consists of geometric designs built from various interlocking combinations involving the eight-pointed star. This design appears on several different media during the Nasrid period, including wood, stucco, and textiles (for textile and wood examples, see Ecker 2004, pp. 47–51 and 139 –140, cat. nos. 42– 44, from the Hispanic Society of America, New York, although there are several more in other collections). Each panel includes a floral or foliate design painted on a brown ground and divided from other panels with borders in high relief, painted in light blue outlined by bright yellow and red. Although wooden ceilings from Islamic Spain often survive in fragments, it is rare to find a coherent group of ceiling elements, such as these three panels. Calligraphic wood beam, Spain, Al-Andalus, Nasrid, 14th century, Wood. This skilfully carved, long rectangular wooden beam includes an inscription in Kufic of an Arabic couplet framed between two horizontal bands. The inscription is intertwined with an intricate vegetal design composed of interlacing vine scrolls ending in single leaves and split palmettes. Vegetal and epigraphic ornament are differentiated from one another by the addition of an increased amount of detailing carved into the foliate pattern; this helps highlight the inscription carved in the bevelled technique against the dense background. The overall carving style seems to have been common in Nasrid Spain (1238 –1492) and even in contemporary North Africa in a variety of media. In Spain, it shows up in the stucco decoration of the “Hall of the Two Sisters” at the Alhambra, built in the fourteenth century (see Barrucand 2002, pp. 202– 203). Similar motifs involving calligraphy juxtaposed with vegetal carving can also be observed in a wooden beam from Toledo dated 1360 and in a carved stucco panel from thirteenth- or fourteenth-century Spain or North Africa, both in the David Collection, Copenhagen (von Folsach 2001, p. 270 [no. 434, inv. no. D 14 /1986] and p.251 [no. 400, inv. no. 35/1978, accidentally printed in reverse], respectively). Two carved, painted and partially gilded pine friezes have successively appeared on sale. Both come from the same Almohad palatial collection in Spain. 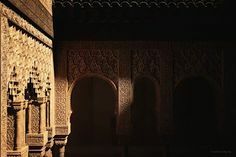 The use of pine rather than cedar clearly leads us back to al-Andalus. The preserved parts, 6.26 metres long, are decorated with an inscription in tawil meters reproducing an ode of pre-Islamic Arabia. The equal lengths of the two parts, of over three metres, and the sequence they form, indicating how they would fit in a square room of just over 9 meter squared. 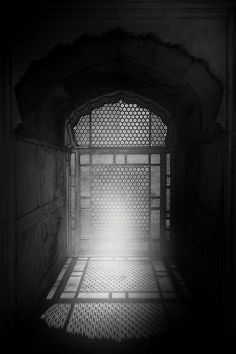 One could link them to later constructions, such as the Tower of the Captive at the Alhambra, which was square, with a section of a qasida inscribed on each wall. The two friezes were placed on two perpendicular walls, probably at the base of the ceiling. Indeed, the two texts follow each other, contrary to the information that was given on the two successive sales. Panel B, which was sold first and presented here, follows panel A. They both belong therefore to a qasida of the jahiliyya poet Samaw’al ibn ³Adiya, who died in circa 560. The text differs in parts from the edited text of the divan; notably, in the first hemistich of the last verse, the subject changes; the “I” becomes “we”; in one of the verses, the word dhibat is substituted with suyuf (the swords); lastly, an entire distich has been displaced to later on in the text. However, as each distich constitutes a complete sense unit, this shift hardly affects the flow of the text. The use of pre-Islamic poetry deserves to be highlighted: it indicates a particularly literate environment replete with memories of original Arab poetry. This sensitivity underscores once more Spain’s role as the land of the preservation of classical Arab poetry. This in turn gave way, more than a century later, to a dialogue between the most illustrious of poets, historians and viziers of Nasrid Spain, Lisan al-Din ibn al-Khatib (d. 1374), and the greatest historian of Islam, Ibn Khaldun (d. 1406), on the preservation of the vestiges of the literary glory of the Arabs at the end of Arab Spain, whereas in the rest of the Arab world, where history is still being written, a technical and practical language has been born. The inscription is couched in angular writing without any diacritic signs. The letters are reduced to a third of the available height on the base-line, strongly contrasting with the long downstrokes. The crossed lam-alif on panel A are characterized by a polylobate motif in the upper third. Lastly, the loop of the lam rises and curls around the downstroke. The size of the downstrokes rules out the possibility that the inscription belongs to the Almoravid period. Nonetheless, the contours of the torus and several epigraphic marks make it more similar to an undated Qur’anic inscription at the Batha museum in Fes or a prismatic stele in the same museum dated 580 H / 1184 CE. The form of the ha (panel A), made with two embedded spherical triangles (or twisted ha) is a specific marker of this inscription; it was present in the East at the end of the eleventh century and is to be found on two funerary inscriptions in Badajoz dated respectively 539 H / 1144 CE and 556 H / 1160 CE. Equivalents can also be found in the Marinid and Nasrid inscriptions, however, it is the plant-like decoration, the simplicity of which contrasts with the Marinid woods, which suggests an assignment to a much earlier date, in the course of the twelfth century. The peacock is associated with Paradise and royalty; it is depicted on a wide range of Islamic objects, from ceramic bowls to textiles, metalwork and book arts. Some believe that the peacock was ejected from Paradise with Adam and Eve, explaining its mournful cries. The peacock is a very popular motif for the decoration of ceramic bowls throughout the Islamic world, from North Africa to Central Asia, over a long span of time. The bird’s shape fits neatly within the cavetto and the tail feathers are often curved back toward its head. The decorative motifs, technique, and palette of this bowl are typical of North African ceramic production: a large bird with incised details is painted in green, yellow, and manganese against a dark yellow ground. The technique of cut glass in the Islamic world became most popular in the ninth and tenth centuries, appearing in a variety of forms, including relief patterns created from wheels made of stone, metal, or wood, and drills for incision made of stone or diamond points (Carboni 2001, p. 71). This rectangular box, revealing some polychrome iridescence, consists of two parts joined together, both free-blown and wheel-cut; the top includes a design of two circles containing lozenge motifs and the bottom includes one of two kite-shaped motifs. The bronze hinges and clasp each end in a pair of rams’ horns. The wheel-cutting technique predates the Islamic period as it was used widely by the Romans and the Sasanians. Around the fourth or fifth century, the practice appears to have declined throughout the Mediterranean; it then resurfaced in the eighth and ninth centuries in the eastern Islamic world, particularly in Iran and Iraq (Carboni and Whitehouse 2001, p. 155). While the technique is associated more closely with the eastern Islamic lands, the form of this object is reminiscent of caskets produced in Islamic Spain and Sicily (see, for example, Dodds 1992, p. 192 [no. 2], or von Folsach 2001, p. 255 [no. 407]). A taste for the Middle East had already existed since the earliest Umayyads of Spain experienced nostalgia for their homeland in Syria and the eastern Mediterranean region, which had been lost to the Abbasids who overthrew them. However, it is possible that the arrival of a certain Ziryab – a freedman of the Abbasid caliph al-Mahdi (r. 775–785) who is credited with introducing Abbasid court traditions of music, dress, food, and proper etiquette to the Umayyads of Spain (Dodds 1992, p. 42) – may also have inspired the transmission of artistic tastes and techniques that spread throughout the rest of the western Islamic world. There is a long tradition of inscribed marble funerary steles in the Islamic world. This stele is a dignified example of North African production, typically Tunisian, during the tenth and eleventh centuries. The fifteen-line Kufic inscription includes the name of someone who was possibly a leather merchant (jallad, although this could also imply the profession of a torturer, according to Abdullah Ghouchani). Mid-Sha³ban 376 H / 29 December 986 CE is the date given for his death and for the collection of his body by his brother from the city in which he died. The date inscribed for his burial in another city, most likely his hometown, is mid-Jumada II 377 H / 15 October 987 CE, which means he was interred some ten months after he died. The city of death has been read as Cairo (Misr) but also as Mansuf. The stele was not made from a ‘new’ piece of marble, but fom a Roman baluster with large scrolling acanthus leaves carved in deep intaglio. It probably dates back to around 300 CE and must have lain unused with architectural debris for seven hundred years before being turned into a funerary stele. Such examples of reuse of precious materials point to the scarcity of materials in areas such as North Africa.